Economize R$ 70,60 (80 %). Comprar eBook Kindle. All of us have lurking in our DNA a most remarkable gene, which has a crucial job - it protects us from cancer. Known simply as p53, this gene constantly scans our cells to ensure that they grow and divide without mishap, as part of the routine maintenance of our bodies. If a cell makes a mistake in copying its DNA during the process of division, p53 stops it in its tracks, summoning a repair team before allowing the cell to carry on dividing. If the mistake is irreparable and the rogue cell threatens to grow out of control, p53 commands the cell to commit suicide. Cancer cannot develop unless p53 itself is damaged or prevented from functioning normally. Perhaps unsurprisingly, p53 is the most studied single gene in history. This book tells the story of medical science's mission to unravel the mysteries of this crucial gene, and to get to the heart of what happens in our cells when they turn cancerous. Through the personal accounts of key researchers, p53: The Gene that Cracked the Cancer Code reveals the fascination of the quest for scientific understanding, as well as the huge excitement of the chase for new cures - the hype, the enthusiasm, the lost opportunities, the blind alleys, and the thrilling breakthroughs. And as the long-anticipated revolution in cancer treatment tailored to each individual patient's symptoms begins to take off at last, p53 remains at the cutting edge. This timely tale of scientific discovery highlights the tremendous recent advances made in our understanding of cancer, a disease that affects more than one in three of us at some point in our lives. Comece a ler p53: The Gene that Cracked the Cancer Code (English Edition) no seu Kindle em menos de um minuto. Sue Armstrong is a writer and broadcaster specialising in science, health and development issues. As a foreign correspondent based in Brussels and then South Africa, Sue has written for a wide variety of publications and audiences, including New Scientist magazine, the World Health Organisation and UNAIDS, and for many years she reported on the AIDS pandemic from the frontline in Africa, Asia and the Caribbean. Now based in Scotland, Sue has worked on many feature programmes, on science and other topics, for BBC Radio 4 and the BBC World Service. Overall, I enjoyed this book. It is as advertised, a book focused exclusively on one gene and how it relates to cancer. The author goes into great detail of how the gene was discovered and how it was originally misdiagnosed as a gene which causes cancer before its true nature was discovered. Of particular interests was the chapter, “The Smoking Gun” which discussed the discovery of how smoking caused a mutation at a specific location in this gene. It is this mutation which make people susceptible to cancer and this discovery which eventual led the cigarette companies to admit the truth. This was a particularly quick read. I would have preferred if the book strayed beyond the P53 gene and discuss more of the other genes related to cancer. Although well written, I am not sure there was enough information about just this one gene for an entire book. When reading the book and following through the scientific discoveries, the author would at times bring up a new scientist/researcher which she would then introduce in the book. She went into significant detail not only about the researcher’s life, but also about her interview with the researcher. She would discuss details about his house, expression property, etc. (almost like filler material). I found this to be more of a distraction and after reading this, I needed to go pack a few pages to remember what the topic of research was being discussed. Despite this one critique, I found this book to be very good and would recommend it to anyone interested in cancer research. 16 pessoas acharam isso útil. Fun and informative, this is worth a read. There is essentially no science here, and after a while the obligatory human interest nuggets which are the prelude to each new topic become a little irritating. P53 is an incredibly relevant protein in cancer and aging, but too little of its scientific contradictions and complexities come across. If the outcome of this read is to provoke curiosity but not satisfy it, it succeeds. This is in itself is a worthwhile objective, but fundamentally disappointing. 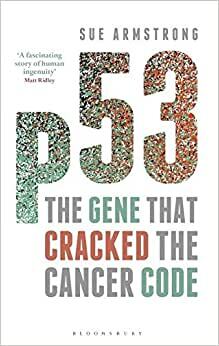 p53: THE GENE THAT CRACKED THE CANCER CODE by Sue Armstrong seems to be a reasonably comprehensive overview of the topic that even those with but a modicum knowledge level of genetics and biochemistry should find readable and comprehensible. The author jumps back and forth in time to show how the aggregate work of a multitude of researchers accumulated and built on itself to arrive at the understanding we have today about p53. This lends the narrative a choppiness which might have been ameliorated at the conclusion if Armstrong had provided a concise summary of the scientific findings to date. This she failed to do and the book suffers somewhat for its absence. p53: THE GENE THAT CRACKED THE CANCER CODE is, however, a commendable contribution to the popular science genre. Although I have been somewhat familiar with the p53 literature for a number of years, I was greatly informed and entertained by this narrative; the author does a fine job of weaving the science with the mystery of this extremely important transcription factor. The book hits on so many areas of cell and molecular biology in a very understandable and human way that I am even considering adopting it as supplemental reading for my college-level intro to cell biology and genetics course. Some nice but extraneous minutia of the people involved in p53's discovery, but their achievements and the science of p53 itself are pretty clearly explained. After reading it, you get a good sense of how important p53 is as a target for future cancer therapies. The book makes you realize the complexity of the p53 (and presumably other tumor suppressor gene) pathways. Kevetrin is one compound with promise to target p53. There is already hope.